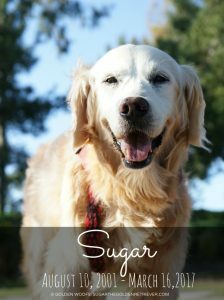 Coming from the Midwest, Sugar experienced frigid, snowy winter weather. She absolutely is not missing it. Sugar is loving sunny SoCal beach winter weather. 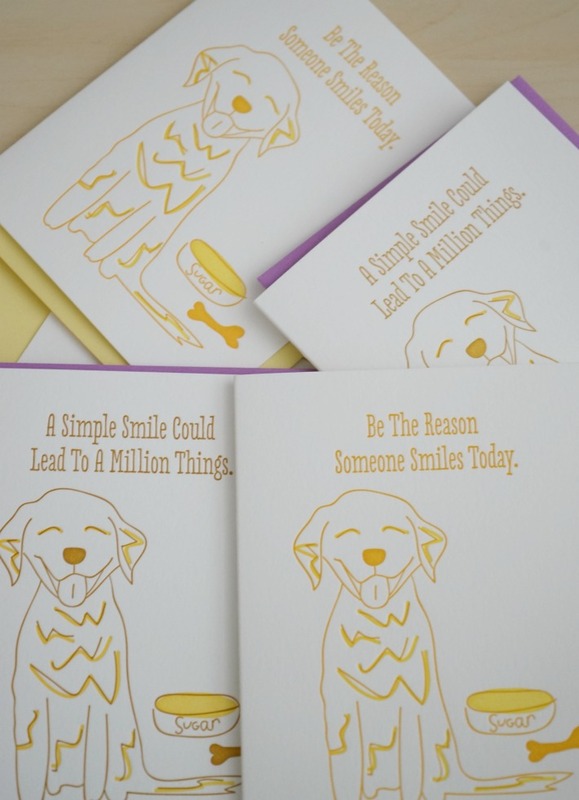 Lots of Golden Thanks to our pals from PL360. They sent Sugar goodies and includes PL360 All-in-One Gel Shampoo & Conditioner, Fresh Pomegranate. Sugar had a pawsome refreshing bath. Does your dog shed? Many breeds of dogs shed their coat. Weather and change of seasons play a big role when it comes to how much your dog can shed. You can’t stop dog shedding, but you can reduce it by keeping your dog healthy and well-groomed. One way to reduce shedding is to use Shed Control Dog Shampoo. Recently, we bathed Sugar and used Earthbath Shed Control Dog Shampoo. 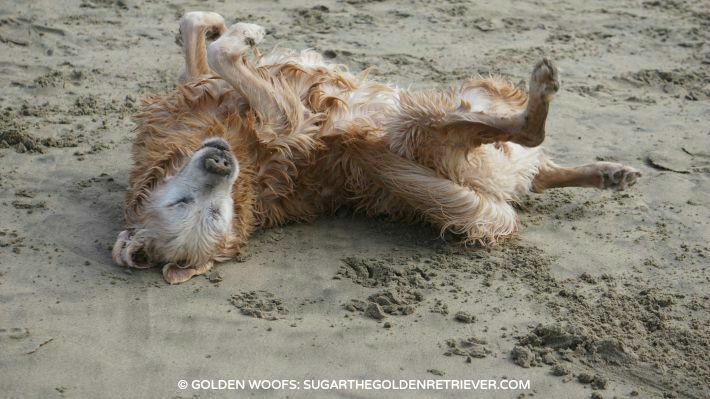 Sugar always enjoys a refreshing bath especially after a Golden Fun beach adventure. 1. Natural Approach – Earthbath Shed Control Dog Shampoo is blended with the finest antioxidants and skin moisturizers found in nature. 2. Organic Fair Trade Ingredients – Earthbath Shed Control Dog Shampoo contains organic fair trade shea butter, essential green tea leaf extract, ginseng, omega-6 fatty acids, and awapuhi. Green Tea Leaf Extract is known to have beneficial effects on dog’s skin. It’s a natural product used in many human products and safe for pets. It’s an anti-oxidant that protects and soothes dog’s skin against environmental damage. Hawaiian Awapuhi is a “magical” ingredient that creates a super-natural skin and coat; leaving your pet’s coat soft, plush and shiny. 3. 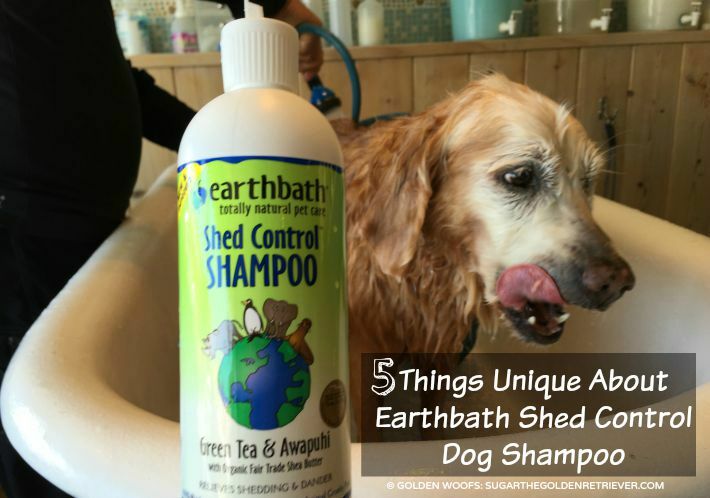 No Harmful Ingredients – Earthbath Shed Control Dog Shampoo uses safe ingredients for your pet and the environment. This product contains no soap, gluten, DEA, parabens, synthetic dyes, perfumes, and is animal cruelty-free. 4. 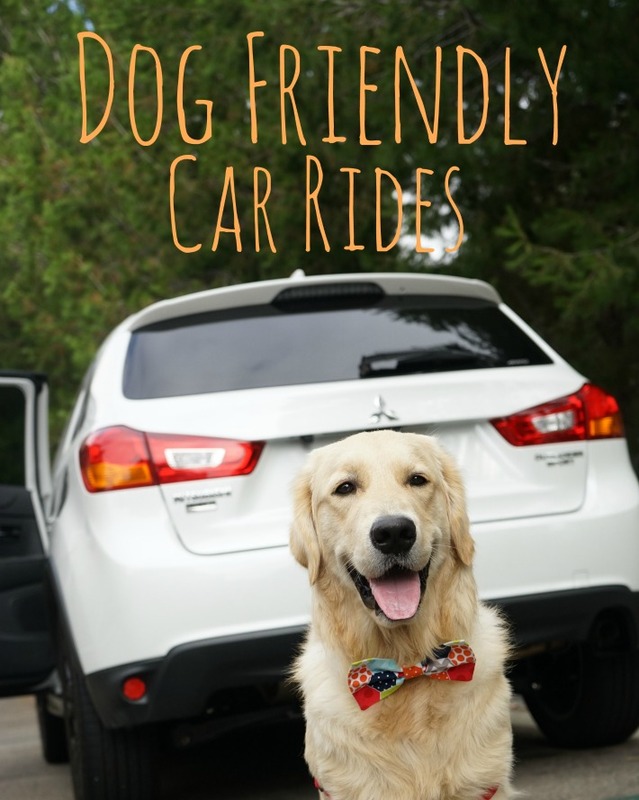 Thoroughly Cleans and Deodorizes your dog. 5. 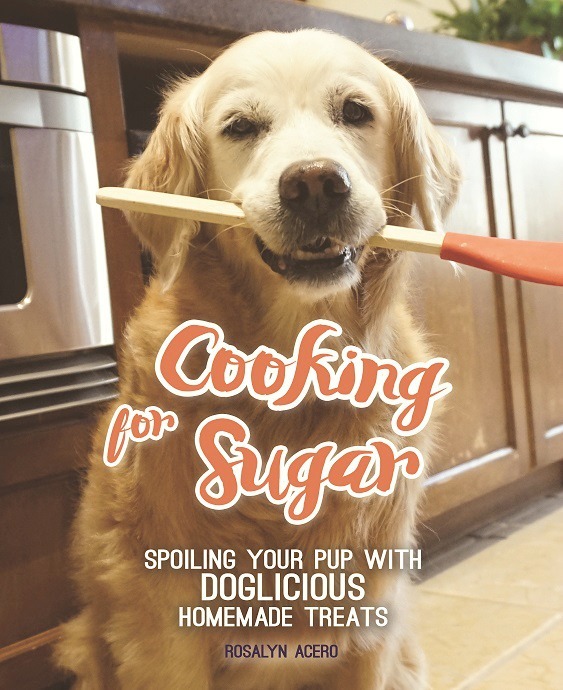 Nourish and Detoxify your dog’s skin. Rejuvenate, manages your dog’s shedding, and making your dog’s fur extra soft. 1. 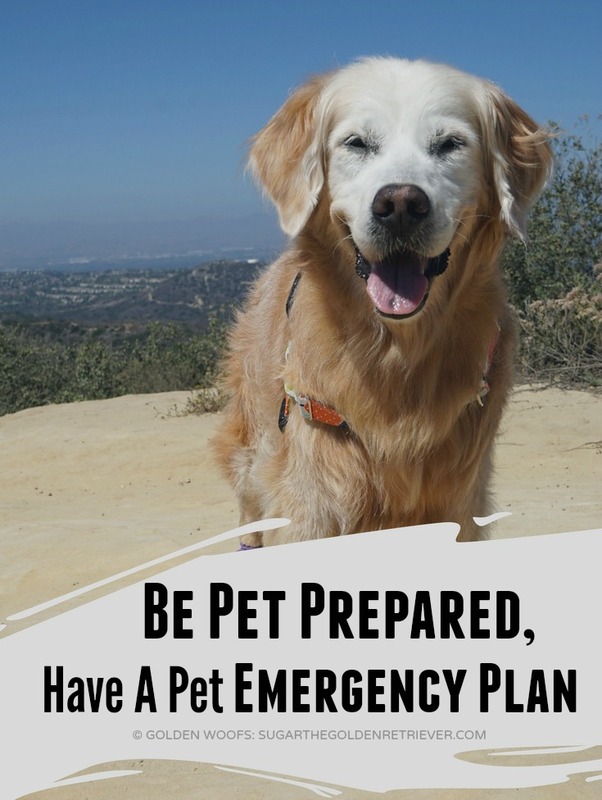 Gain control over your dog’s shedding and considerably reduce it. 2. Shed control dog shampoo like Earthbath is created to enrich dog’s skin and coat specifically. The rich foam penetrates deep into your dog’s skin and provides the maximum benefits managing dog shedding. 3. 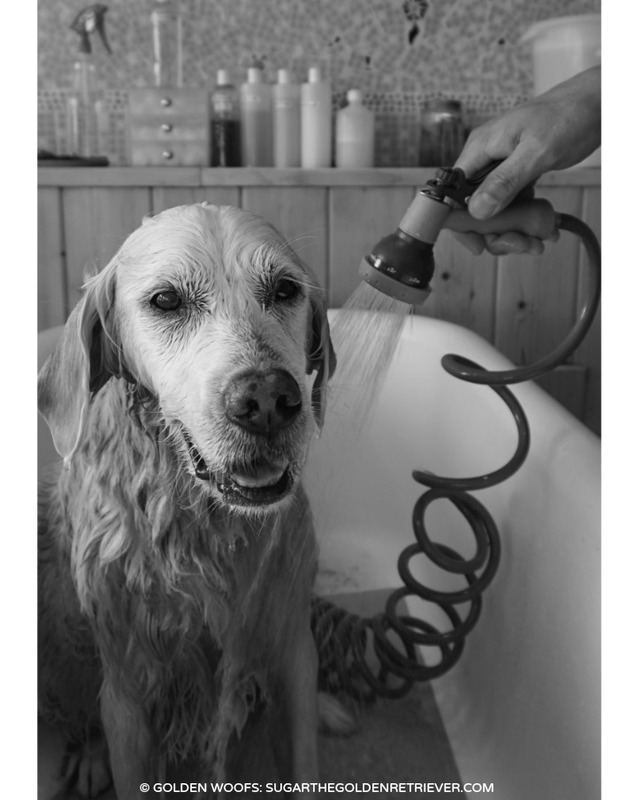 Shed control dog shampoo like Earthbath contains omega-6 fatty that helps moisturize dog’s skin. For best results, Earthbath recommends the use of Shed Control Shampoo in conjunction with Shed Control Conditioner. We only use the Shed Control Shampoo for this review post. 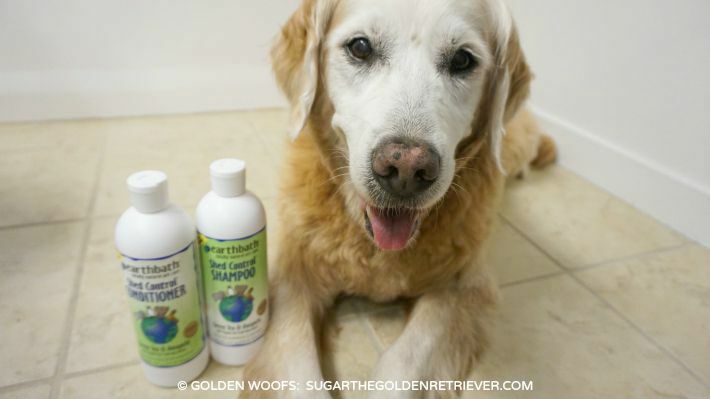 Golden Thanks to Earthbath for providing Sugar Shed Control Dog Shampoo and Conditioner. Golden Woofs was not compensated for this post review. 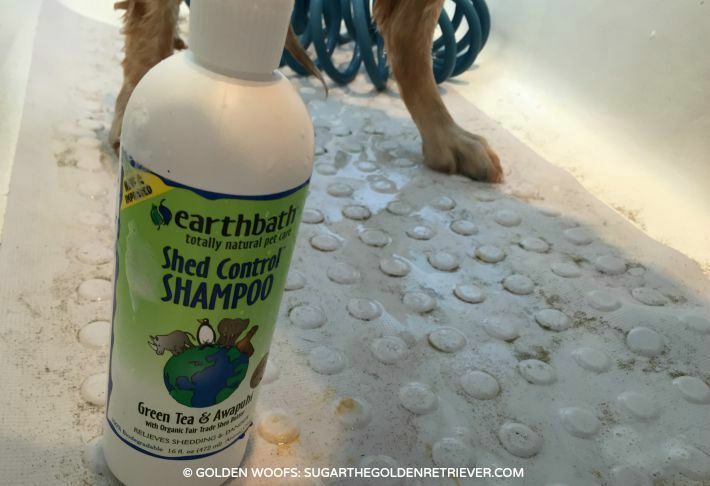 Earthbath is providing one of our readers a bottle of Shed Control Shampoo and Conditioner. Follow the giveaway tool to join. 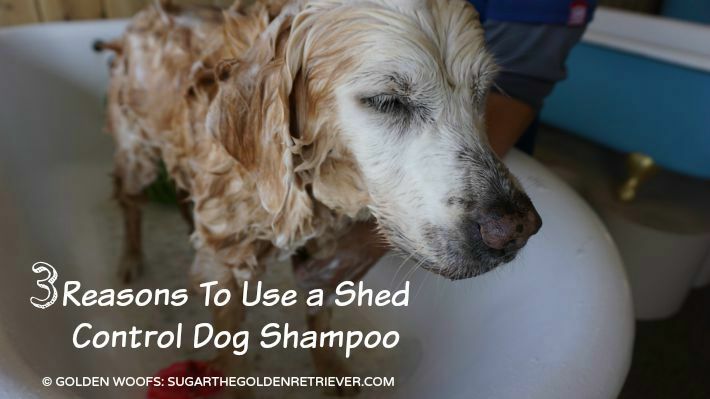 Do you use a Shed Control Dog Shampoo? 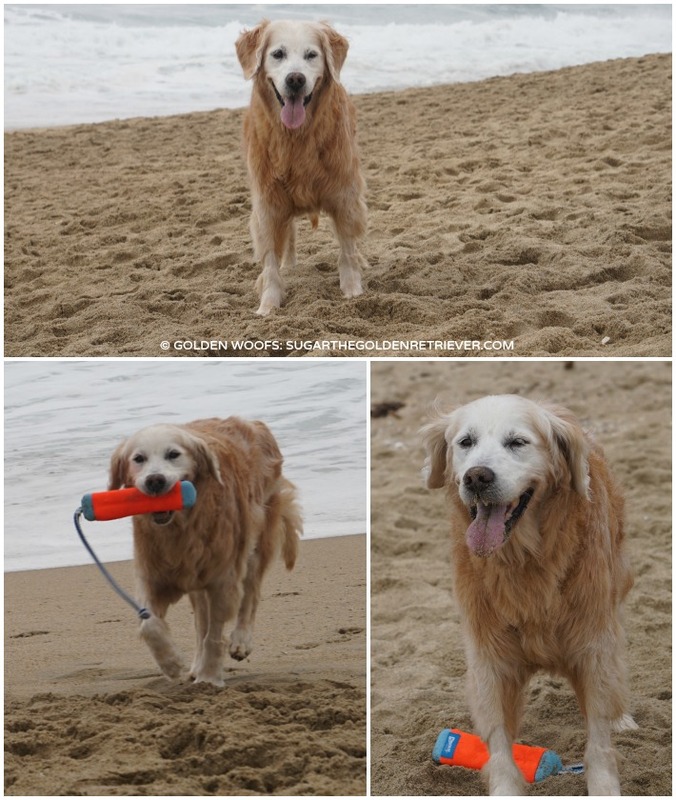 I am a Golden Dog that loves water. I don’t mind getting a bath. I Golden LOVE baths. If you are follower of my blog, you’ve seen many of my outdoor baths. Here’s my latest outdoor bath with Cloud Star Buddy Wash, Lavender & Mint. It’s not my first time to use Buddy Wash shampoo + conditioner. Golden LOVE Lavender, it’s scent combine with the mint creates a calming and refreshing bath. It’s FUN having a bath but the “drying” portion is the most time consuming. Typically, it takes 3 large towels to dry my Golden Fur. Golden Happy to receive the Super Shammy from Soggy Doggy. Problem solved. Super Shammy is microfiber chenille dog towel. It is super absorbent, 5x more absorbent than regular cotton towels. 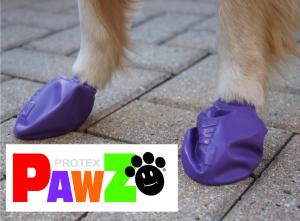 It has triangle corners to provide “2 pockets”, where you can place your hands and have more control on drying your dog’s fur. I thoroughly Golden Enjoy getting rubbed by Super Shammy. It was super soft and provided me a gentle massage too. Golden Surprise how Super Shammy dried my Golden Fur. I invite you to watch my 36sec Got Super Shammy? video (below). 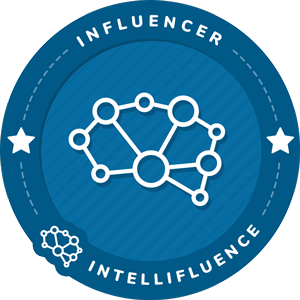 For better video quality (and to compliment my mom’s photos), we decided to change our blog video platform to Vimeo. Check it out and LOVE to hear your comments. Got Super Shammy? from Golden Woofs on Vimeo. My mom has washed/dried the Super Shammy several times and it retains its shape and fluffiness. 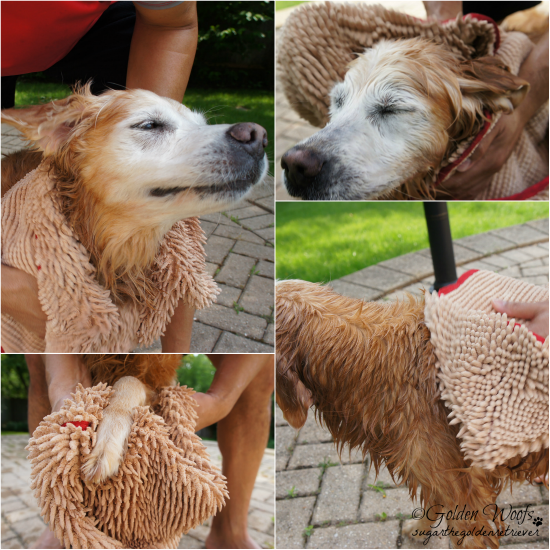 Super Shammy takes drying a soggy dog to a new level. 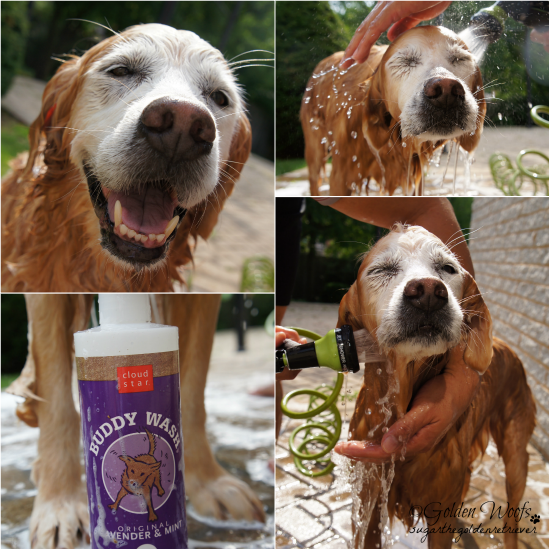 We give Super Shammy by Soggy Doggy 4 Golden Paws. 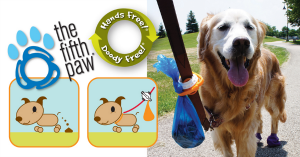 Super Shammy is a “must have” product for any dog owner. Lots of Golden Thanks to Soggy Doggy for providing me Super Shammy. Golden LOVE Super Shammy and it will definitely be put to use a lot. 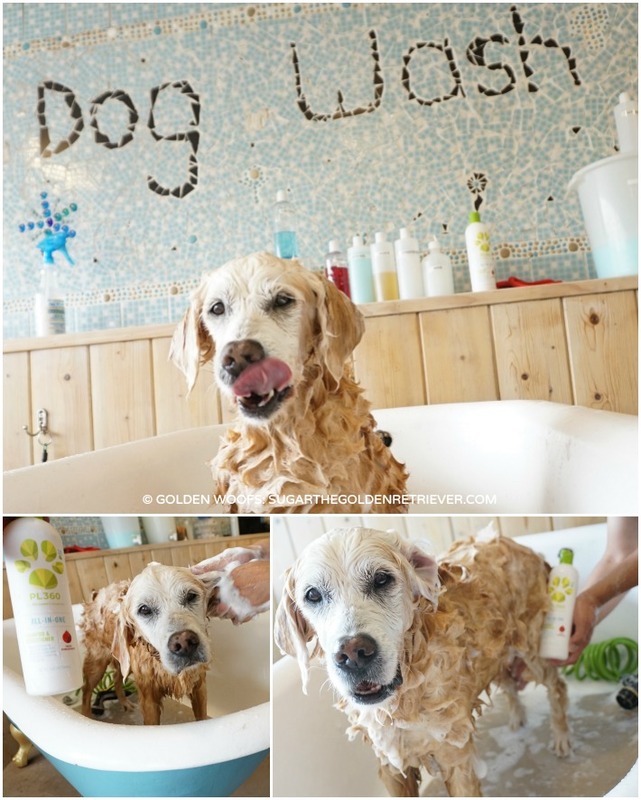 Disclaimer: Soggy Doggy provided Sugar The Golden Retriever a Super Shammy for a review. 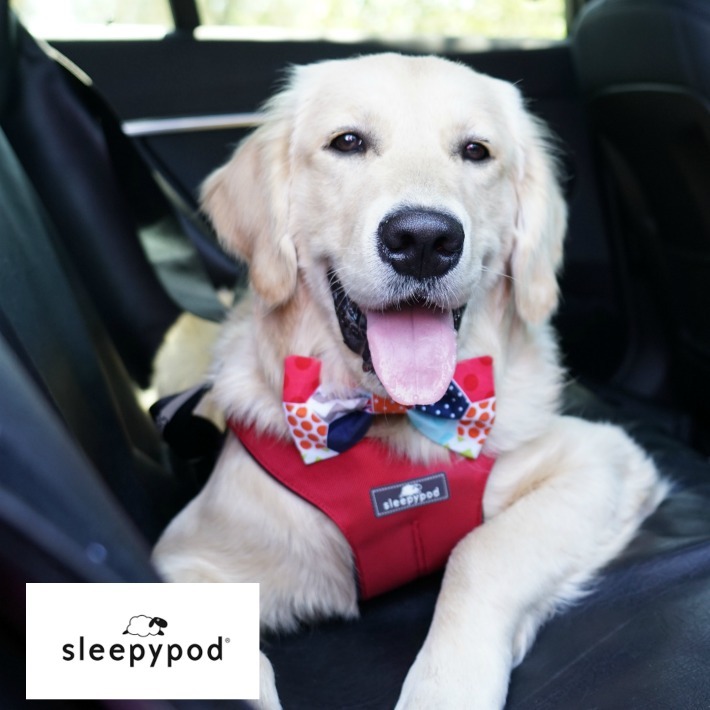 Golden Woofs did not receive any monetary compensation for this review post/video. 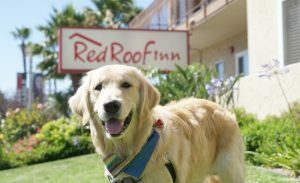 Golden Woofs purchased Cloud Star Buddy Wash and did receive additional benefits from mentioning it. 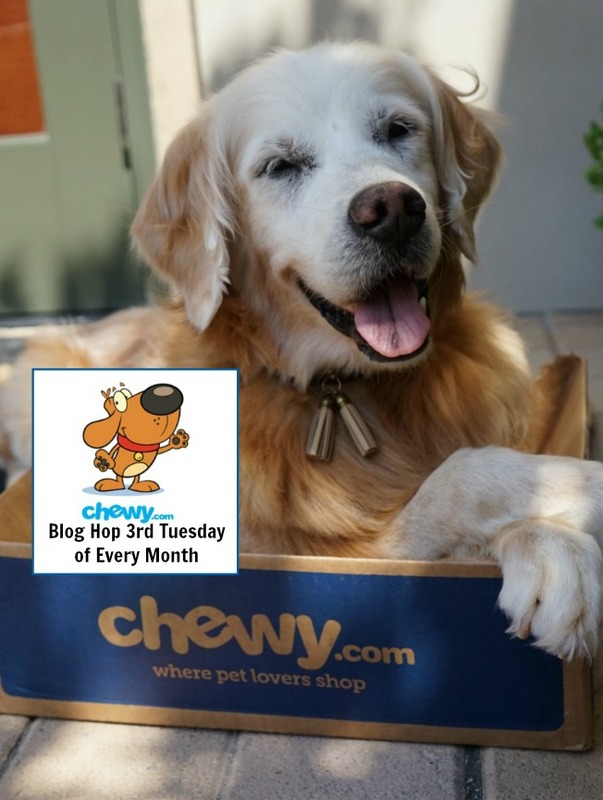 My Golden FUR Got Buttered: Why Apply Conditioner On Your Dog’s Fur? I Golden Love a good soothing bath. Last year, I shared many of my outdoor baths using different products I enjoyed. The people from Vitacost must have read my posts as they send me Fur Butter Deep Conditioner Treatment, product made by Happy Tails Spa. Outdoor bath is not optimal due to the odd weather we are having. I needed to get groomed too so I went to the groomers. Mom brought the special conditioner Fur Butter and asked Tom (my groomer) to use it after I get shampooed. My Golden Fur got Buttered-Up. 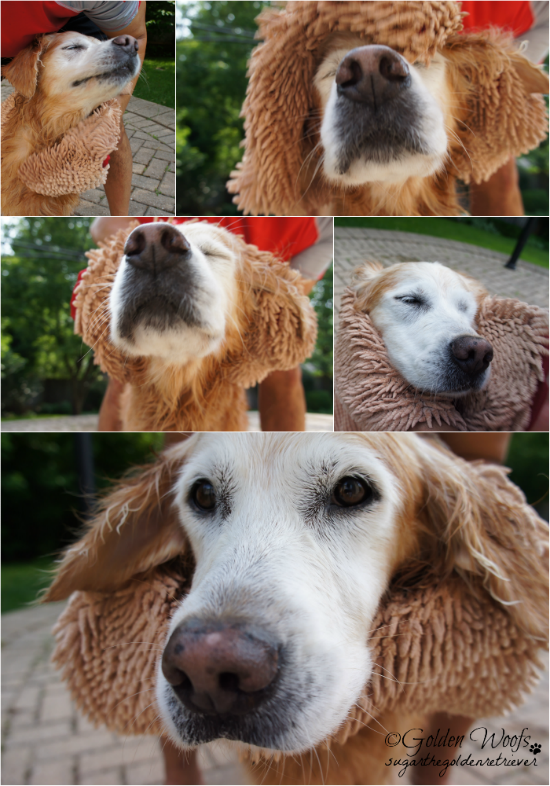 Mom wanted to take photos of me while getting a bath but it will cause a disturbance to the the other clients (dogs). Tom followed the instruction on the container. Basically, after I got shampooed/rinsed, Tom applied my Golden Fur with Fur Butter. He said it smelled good. It did not lather as it is a conditioner. I was not bothered when he applied it on my fur. 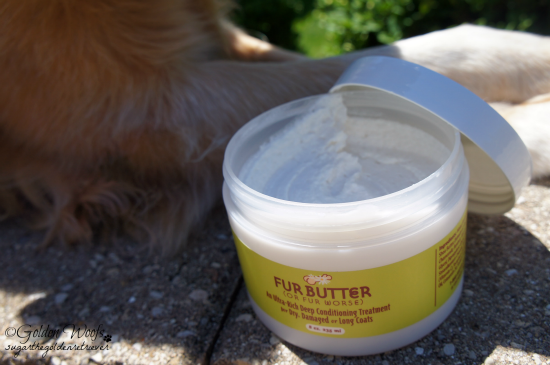 Fur Butter ‘s 2 main ingredients are Shea Butter and Oatmeal. It was Pawfect as I have some dryness on my skin. Do you apply conditioner on your dog’s fur? Shampoo get rids of dirt from the skin and coat. Did you know that after shampooing it leaves the fur(hair) shaft open where residue can enter and oils escape.It is important to seal it by applying a conditioner which will close the fur (hair) cuticle and it will restore moisture and gives a shiny appearance. I wish you can smell me as I smell like Rosemary Peppermint, the scents in the Fur Butter. I wish you can feel my fur too as it is super soft. Can you see my Golden Fur is shiny too. 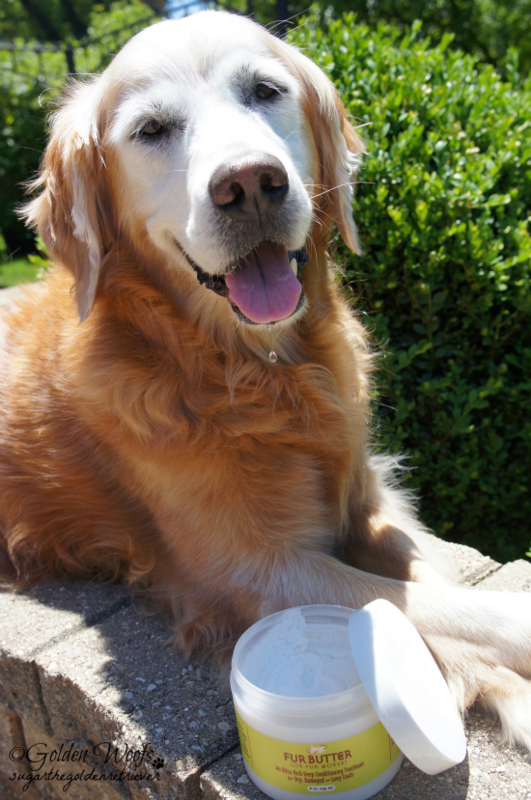 I give Fur Butter 4 Golden Paws Up. 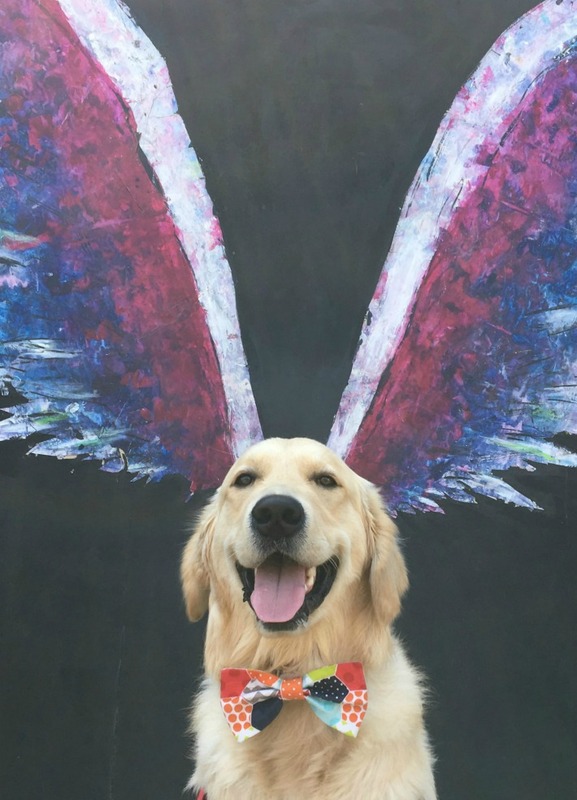 Disclaimer: Golden Woofs:Sugar The Golden Retriever did not receive any monetary compensation for this post/review. Vitacost provided Sugar a free product to try. 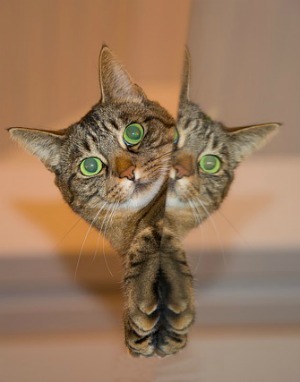 We did not receive additional benefits for talking about Happy Tails maker of Fur Butter.